Kuala Lumpur, Malaysia, January 2018—TRAFFIC’s collaboration with the global transport and logistics sector through the USAID Reducing Opportunities for Unlawful Transport of Endangered Species (ROUTES) Partnership and Wildlife TRAPS Project has been significantly boosted over recent months. Most recently, over 350 staff working at Malaysia’s Kuala Lumpur International Airport and Singapore’s Changi Airport learnt how they can play a part in stopping the trafficking of wildlife. The workshops were hosted by Malaysia Airlines in December 2017 and by Singapore Airlines in October and brought together participants working in a variety of roles, from cabin crew and ground handlers to cargo staff. Participants learnt about the smuggling routes used by wildlife traffickers and how they try to conceal their contraband. Tips were given on identifying smugglers and how to report any suspicions to the appropriate authorities for action. Both airlines are signatories to the United for Wildlife Transport Taskforce Buckingham Palace Declaration. A Prevention of Wildlife Smuggling Workshop was held for DHL eCommerce Viet Nam in their new Ho Chi Minh City hub for customer service, administration and operation staff in October. The workshop, conducted under the Wildlife TRAPS Project, sought to increase understanding of the risks that wildlife trafficking poses and ascertain what action could be taken by the company to mitigate them. TRAFFIC has also conducted similar workshops for DHL in Singapore and Cambodia. 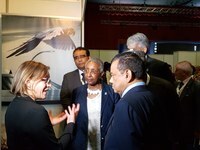 At Airport Council International’s (ACI) Africa/World General Assembly held in Mauritius, the ROUTES Partnership display provided delegates with the opportunity to find out more about the links between air transport and wildlife trafficking and the resources available to minimise the resultant risks. Additional information was provided to the ACI World Environment Security and the Joint Environment, IT and Facilitation Committee meetings and training was provided to a number of airline and airport representatives as part of ACI’s Developing Nations Airport (DNA) Assistance Programme. TRAFFIC’s booth at the World Congress of the International Federation of Freight Forwarders Associations (FIATA) held in Kuala Lumpur in October, focused on the work of the ROUTES Partnership and the Wildlife TRAPS Project. TRAFFIC has been working with FIATA over the past couple of years through Wildlife TRAPS to provide training on wildlife trafficking to demonstrate how FIATA members can help ensure that their services are not used by wildlife smugglers. TRAFFIC’s booth attracted plenty of attention, with many delegates drawn in by the replica ivory tusks, rhino horn, pangolin scales and Radiated Tortoises crated for transport on display. At the Air Transport Action Group (ATAG) Global Sustainable Aviation Summit, held in Geneva at the start of October, Michelle Owen, the ROUTES lead, participated in a security panel, raising the profile of wildlife trafficking as a threat to regional and global aviation. The ROUTES Partner display during the Summit provided an opportunity to share information with aviation sustainability representatives and highlight the actions that airlines are taking to respond to wildlife trafficking. Both ROUTES and Wildlife TRAPS are among the initiatives supported through USAID’s work combating wildlife trafficking, environmental crime and mismanagement of natural resources, which strengthens U.S. and international security, rule of law and global economic prosperity, and which recently featured as among “10 of USAID’s Best” in 2017. The USAID Reducing Opportunities for Unlawful Transport of Endangered Species (ROUTES) Partnership brings together transport and logistics companies, government agencies, development groups, law enforcement, conservation organizations and donors to disrupt wildlife trafficking activities, and forms a key element of the concerted international response to addressing wildlife poaching and associated criminal activities worldwide. Further information and resources can be found at www.routespartnership.org.